Sign up here for a free chapter of How To Create A Fan Blog! Fans are what making music is all about; everyone needs fans to buy their music. Fan engagement is one of those phrases that gets bandied about a lot when talking about releasing new music but what is it? I’ve been writing about music and working with fans for several years now and, in my first blog for a while, this is my take on why fan engagement is absolutely necessary to make a living from music. Making and releasing music without fans to hear and buy doesn’t make sense. Making and releasing music without promoting it doesn’t make sense either. You would also think that making and releasing music without engaging with potential buyers wouldn’t make sense either, but that is exactly what happens across the music industry today. I’m asking the question, therefore, what is fan engagement and why should you do it? Starting with what it isn’t, fan engagement is not just about posting updates about your music and ways in which fans can part with their money. This approach is just broadcasting and has no personal touch – eventually you’re just talking to yourself, and not in a good way. If at this point, you’re tempted to say “everyone does it like this”, please don’t. This approach may be standard, however, in a world of sheep, would you rather be just another woolly sheep ambling along behind, or would you rather be a cute chihuahua leading by example? Being a chihuahua instead of a sheep in the world of fan engagement means that you have to take those two words and really understand them: real fan engagement needs real engagement with fans. In today’s world of streaming, fan loyalty is an important factor in music sales, so ensuring that fans stay loyal is a huge advantage when releasing new music. Loyal fans feel important and when they feel important, they will support everything an artist does – every artist needs a core group of fans like this. And you don’t have to be a mega selling artist to have a core group of fans. Engaging with fans is the lifeblood of maintaining longevity in the music business; if you want a long lasting career, then good fan engagement is what you need. Think about what happens when posting updates on social media channels – stick around after posting and engage with fans. By engage, I mean reply, like, share, retweet, comment. Spending five minutes doing this every day will mean that fans feel important and will be inclined to support your music time and time again. You’ll also gain a huge amount of knowledge about what your fans do and don’t like, which in a world where money talks is like gold dust. Next time you think about engaging with your fans, ask yourself one question: am I a sheep or a chihuahua? In my next series of blogs, I’ll show you why it’s important not to be a sheep! Totally transformed it actually! Read my Huffington Post blog about how this came about – click here. 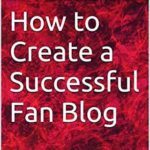 Welcome to my first blog post about How to Create a Successful Fan Blog. For the past three years I have been writing and running a successful fan blog for the British tenor, Alfie Boe. Even though a lot of people had asked me about starting a blog, I was totally taken aback and overwhelmed when it became an amazon bestseller in the first week of release! To say you could have knocked me down with a feather is an understatement. If you want to know how to take the first steps in blogging then click here to buy. I started writing after reading (what seemed to me) yet another poorly researched interview about Alfie and thought I could do better. I set up a WordPress account very quickly and published my first few posts. To my surprise and delight, other Alfie fans liked it and before I knew where I was, I had caught the blogging bug. Audience engagement figures continued to rise and after a while I landed my first interview, with Alfie’s brother Michael, also a gifted tenor. That led on to other interviews which eventually led to being accepted as a Huffington Post blogger. Now if this all sounds idyllic and easy, it wasn’t. By no means was it a bed of roses but like anything, the ups more than made up for the downs. The downs included the problem of staring at a blank page and not knowing what to write (still happens! ), striking the right tone and balance with posts and the difficulty of juggling a full time job and a family with running a fan blog. Two years into writing the blog, I took the bold decision to leave my day job and writing quickly became my salvation as I was able to devote more time to it.